The Westworld church at Paramount Ranch survived the conflagration. As I drove out to Paramount Ranch, the historic movie location near Agoura Hills mostly destroyed in the Woolsey Fire, a few hot spots still smoldered on the blackened hillsides of the Calabasas Grade. Splashes of fuchsia along the slopes and on Agoura Road marked places where air tankers had dropped Phos-Chek fire retardant to slow the progress of the fire, which eventually burned more than 150 square miles. For those of us who live in the Santa Monica Mountains, this was the “Big One,” the long-anticipated wildfire counterpart to the inevitable mega earthquake predicted to strike Southern California—maybe tomorrow, maybe years in the future. The mountains had remained largely fire free as October turned to November, and I embraced the false hope that maybe we had avoided disaster for yet another year. That the rains would arrive before the Santa Ana winds began to blow and some random spark might metastasize into a conflagration that would torch thousands of acres of chaparral, coastal sage scrub, and non-native grasslands, volatile and primed to burn after years of drought. Then last Thursday, I caught word of a fire near Chatsworth and went up to the Summit-to-Summit Motorway above my Calabasas neighborhood to look for smoke. An arson watch volunteer staked out on the ridge said the smoke seemed to be diminishing. But as night came, I could see open flame on the slopes along the west rim of the valley, glowing and growing brighter as the winds continued to blow. The trip to Paramount Ranch today was for a media briefing organized by Santa Monica Mountains National Recreation Area (SMMNRA) to provide updates on conditions in the world’s largest urban national park, which sprawls across more than 150,000 acres of the range. The Santa Anas had eased and an American flag outside one of Paramount Ranch’s surviving buildings hanged limply, lowered to half-staff in honor of the victims of last week’s mass shooting in Thousand Oaks. The massacre occurred the night before the Woolsey Fire started; it has been a brutal week in these parts. Fire crews worked on the slopes across from Paramount, their bright orange gear jumping out against a landscape stripped of vegetation and scorched to various gradations of tan, gray, and black. Moviemaking at Paramount Ranch dates back to the 1920s but the fire had reduced the old Western Town, created in the 1950s, to a pile of charred debris, covered in places by collapsed and twisted corrugated steel roofs. Paramount Ranch’s film history ranges from the dawn of the talkies to the arrival of 3-D movies (an interpretive display for 1953’s Bwana Devil stood partly melted), and all the way to our age of streaming and binge TV viewing. 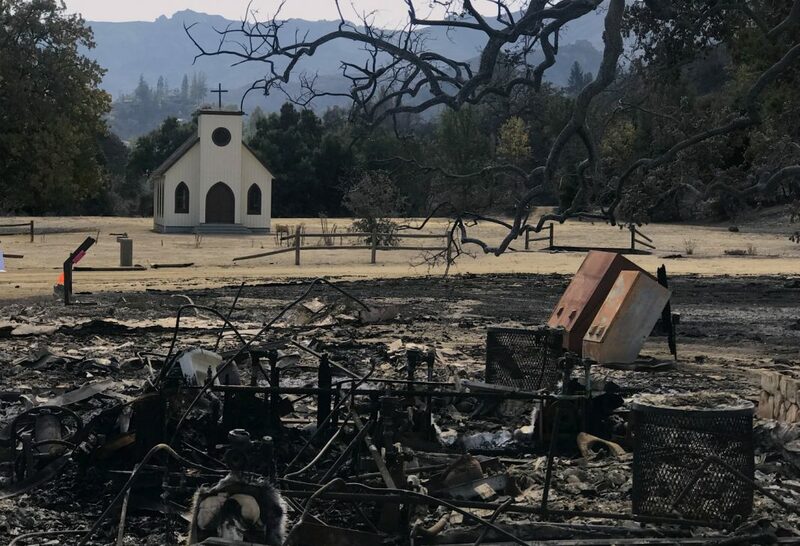 Across from the devastated Western Town and the blackened riparian forest along Medea Creek, dammed for the filming of Huckleberry Finn in 1931, the famous church in HBO’s Westworld had somehow remained untouched by the blaze. 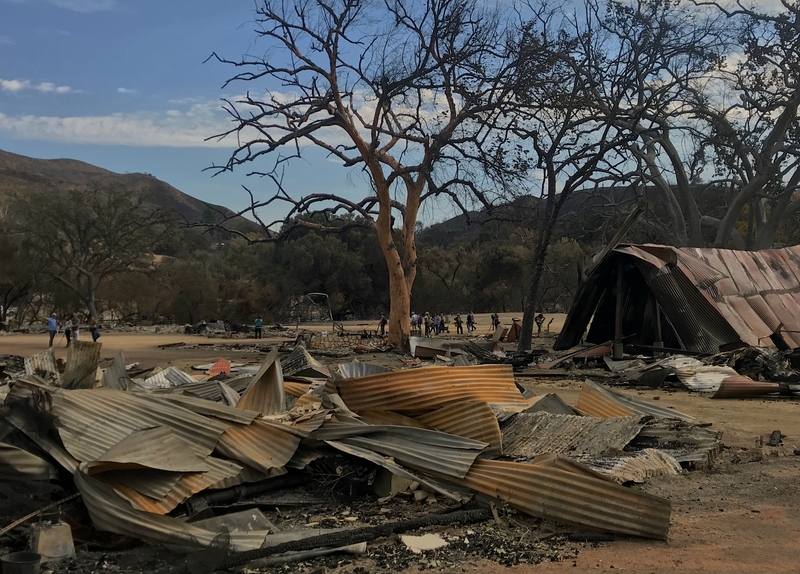 There was no ignoring the Woolsey Fire’s devastation. “We’ve all taken big hits with this fire. We’ve all been expecting at some time or another to get a big Santa Ana wind-driven event…We’ve all dreaded it and tried to prepare. But sometimes the wind just takes over and we do what we can do,” said Rorie Skei, chief deputy executive director of the Santa Monica Mountains Conservancy. Even so, the officials also tried to strike a hopeful tone. “It will be long…but in the end, the sense of place will return,” said Craig Sap, district superintendent with California State Parks. The national park service hopes to rebuild Paramount Ranch’s movie sets within the next two years. 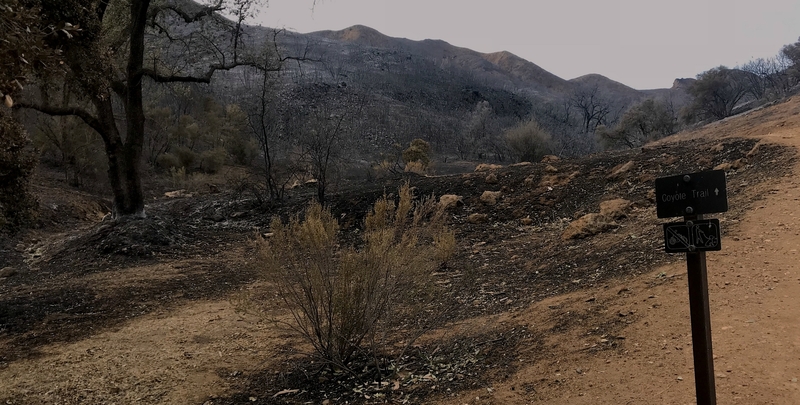 Although an estimated 88 percent of the park service’s acreage burned in the fire, some areas have already reopened, including Rancho Sierra Vista/Satwiwa in the western part of the range beneath the high ramparts of Boney Ridge. King Gillette Ranch, the famous razor magnate’s estate and its 1920s mansion designed by Wallace Neff, survived intact, even as the fire raged through Malibu Creek State Park just across the road. There was also good news about the range’s fragile population of mountain lions and bobcats. SMMNRA park superintendent David Szymanski announced based on radio collar transmissions, at least 12 of the 13 mountain lions under study were definitely alive. After the briefing, I spoke with Szymanski about the fire’s environmental impact. While the mountains lions serve as the most visible symbol of the wildness of the Santa Monicas, they’re by no means the only animals that will confront a vastly altered landscape for the foreseeable future. The park service has been working to protect and reestablish populations in the range of comparatively less charismatic, yet federally threatened or endangered creatures, such as Southern California coast steelhead and red-legged frogs. As I left Paramount Ranch, a murder of crows called noisily from an unburned tree while an acorn woodpecker banged against a valley oak stripped of its leaves. Driving home, I passed a colorful hand-written sign on Cornell Road that defiantly declared “Stronger Than Fire,” and watched a group of kids offering pink lemonade to firefighters at the intersection of Las Virgenes and Mulholland Highway in Malibu Canyon. But along Las Virgenes, I also saw evidence of the fire’s toll: several dead rabbits and ground squirrels, and a large raccoon, whose coat appeared singed by the flames. They’re a reminder that for all of the relief we’re now feeling in these mountains after finally returning to our homes, we’ll also be living with the impacts of the fire in the coming months and years, from the threat of mudslides to displaced wildlife in our neighborhoods. The recovery has started. But so too has the new abnormal. Los Angeles contributor Matt Jaffe is also the author of The Santa Monica Mountains: Range on the Edge, a cultural and natural history of the range. Next articleThe 8 Best Things to Do This Week in L.A.